Preheat the oven to 375°. Lay a piece of parchment paper down on a sheet pan that is large enough to cover. 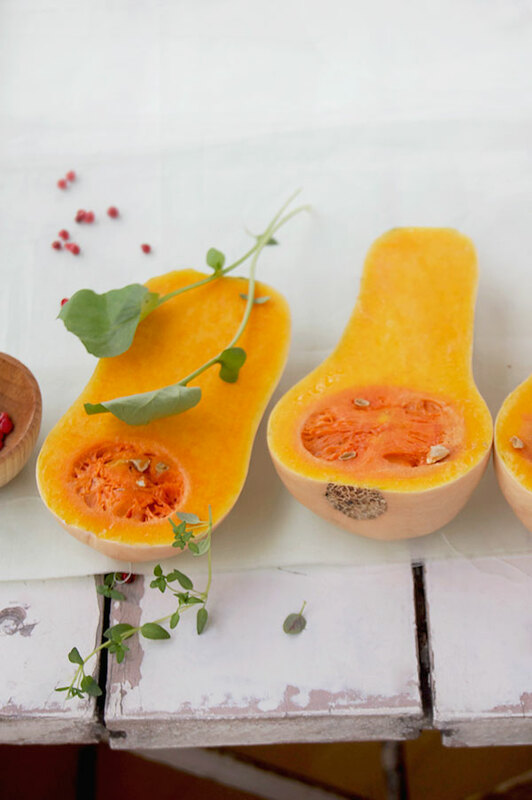 Toss butternut squash pieces with olive oil and season with salt and pepper. 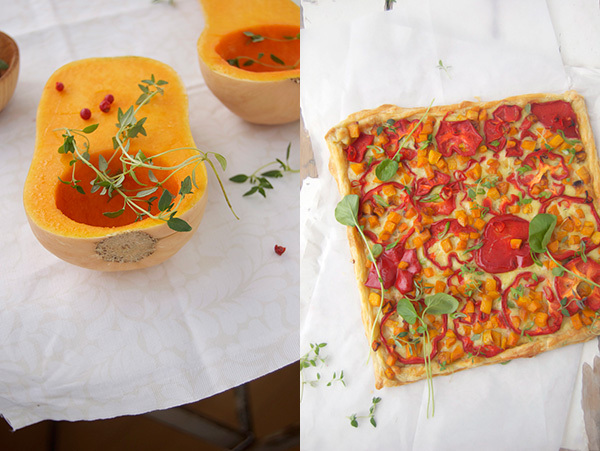 Spread the squash on the lined baking sheet and bake for 20-25 minutes, until tender. Let cool for 5 minutes. Toss with sherry vinegar, and set aside. Meanwhile, in a small saute pan, heat 1/2 tsp butter. Add the sliced shallot over low to medium heat and cook until softened, stirring often. Remove shallots from heat and reserve. Next, thinly slice red peppers, and set aside. Line a baking sheet with parchment paper. On a floured surface, roll out the puff pastry into a 12 by 12 inch square. With a knife, trim any uneven edges and divide down the center if two tarts is desired. Transfer pastry to lined baking sheet and pierce with a fork to prevent it from puffing in the center. Bake for 10-15 minutes, until light golden brown. If pastry puffs during cooking, go ahead and pierce with a fork once over again. 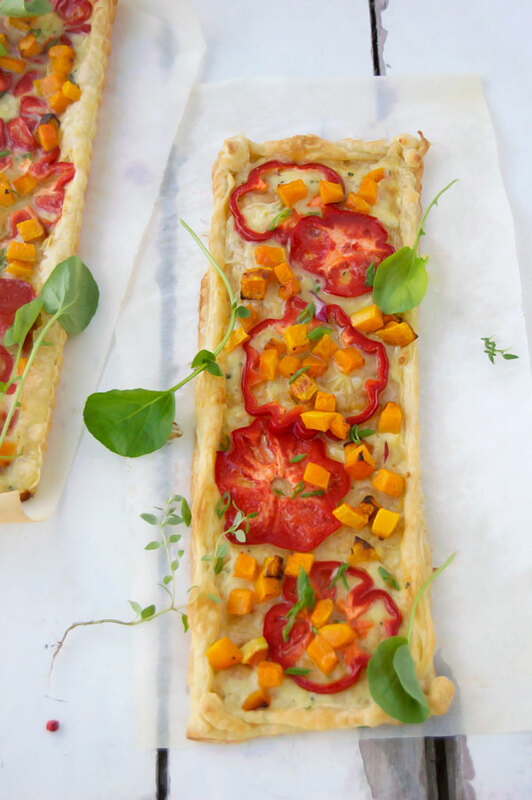 In a small mixing bowl, combine the gruyere, crème fraîche, egg yolks, thyme, nutmeg, season with salt and pepper and spread the mixture over the cooked puff pastry within the borders. Place the butter softened shallots over the cheese mixture, lay bell pepper slices down, and sprinkle butternut squash pieces within and around the peppers. Bake for 10-15 minutes, until cheese is melted. Slice in squares, garnish with greens, a sprig of thyme, a squeeze of lemon juice, and serve. The colours are all too wonderful! Such a pretty dish! I love all the ingredients so I know I’d fall in love with that tart. Looks incredible. Amazing! You are a talent! Great photography, Sarah. Interesting career.